Harley Chapeau seems like part of the fabric of the square. 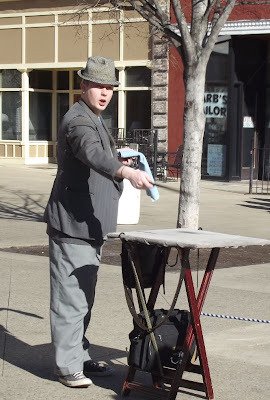 He would blend in like so many visitors from west Knoxville if not for his dapper dress in his vest with matching slacks and 1940s style men’s hat. That, and the tiny fact that he is an ace at drawing attention to himself, which he does with time-worn precision. He’s a practicing street magician and his art is all magic, though it isn’t all in the magic. It’s as much in the way he engages people, draws them in, makes them laugh and makes them stay through his show. He uses hooks – little children seem to love him, and what parent can say, “no” to a child longing for a little magic? And it isn’t just the children: UT students, tourists and random downtown passersby seem to fall under his spell. What’s his secret? He tells me it’s that he loves magic and has since an early age. He also says he loves performing outside the strictures of a stage, which he has done in the past. He says the outdoors is more freeing and I can see that for him. His capacity to engage his audience is increased exponentially when he mingles with them. Once he locks their eyes, they cannot resist. He also tells me he’s worked all over: New Orleans (too much competition), Atlanta (no great place for his act). He says Knoxville and Market Square are perfect for what he does. He’s the only magician in a sea of guitar strummers and the foot traffic is steady and sometimes downright excellent. 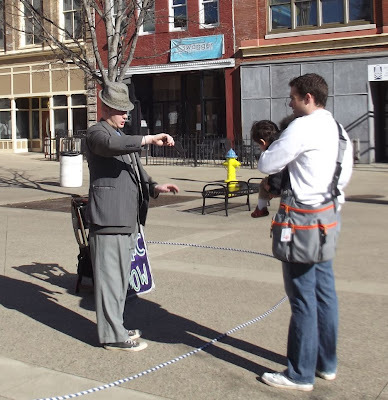 I watched Harvey gather a small group on Market Square last Saturday around noon. I’d seen it dozens of other times. Same thing happens: He sets up in a somewhat florid fashion, walking in big circles and tipping his hat or nodding his head at passersby. Once set up, hand on vest, he engages one person, then another, incredibly adept at holding the first audience members while gathering others. The thing that made this Saturday different was the fact that Harley had gathered an audience on a day when the high temperature hovered one side or the other of freezing while a howling wind made life just a bit more miserable than it would have otherwise been. I could hardly stand to take a walk, let alone stand around waiting for magic to happen. The man has a gift.